Besides maintaining an extensive collection of books and documents about the town of Belmont and its residents, the Belmont Historical Society publishes a newsletter and has provided the content for several books about the town. 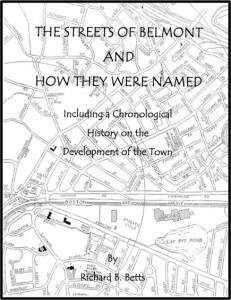 New Book The Society is pleased to announce that a new updated edition of the book The Streets of Belmont and How They Were Named has been published and is now available for purchase. The first edition of this book was created in the mid-1960’s by Richard Betts, a lifelong resident of the town and the official Belmont Historian. That edition has long been out of print, but Richard has worked on the revision for a number of years to bring it up to date. The book provides a comprehensive account of how each and every street in Belmont was laid out and named. The time period covered in the book begins before the town was incorporated in 1859 and continues up to the present day to trace the development of a rural sparsely populated farm community through its steady growth and transition into the “Town of Homes” that it is today. This book will be an invaluable resource for newcomers and lifelong residents alike – for anybody who shares a curiosity and passion for the history of Belmont. You may also be interested in watching a video of Richard Betts’ May 1996 presentation of material from the original edition of The Streets of Boston at a meeting of the Belmont Historical Society. That presentation was videotaped at the time and has recently been digitized by the Belmont Media Center as part of its Belmont Community Moving Image Archive. 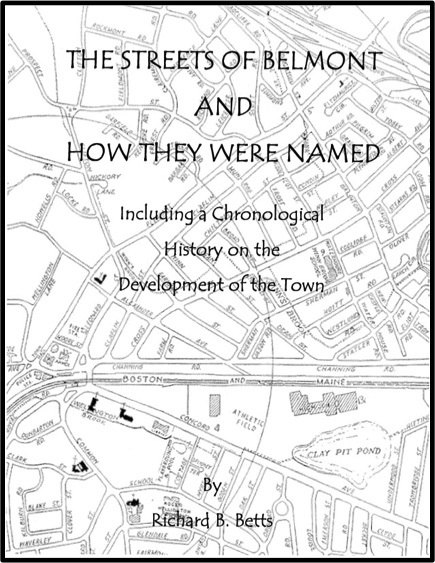 Copies of The Streets of Belmont and How They Were Named are available for $25.00 per copy. You may purchase copies by downloading the order form and mailing it with your check to The Belmont Historical Society, P.O. Box 125, Belmont, MA 02478. You may also purchase copies of the book at the Claflin Room in the Belmont Memorial Library at 336 Concord Avenue, Belmont. The Society publishes a quarterly newsletter that is mailed to all members. The newsletter began in 1966, and the nearly 200 issues that have been published since then provide a unique collection of facts and stories about the town. This cover of the Fall 1970 newsletter, which reviewed the first five years of the revitalized Society, shows the “Belmont Room” (now the Claflin Room) in the then-new Belmont Public Library which is the Society’s “home” and the location of its historical collections. The complete collection of newsletters is available for review and research in the Claflin Room. The preceding introduction is quoted from Images of America: Belmont, © Belmont Historical Society, published by Arcadia Publishing in 2000. Copies are available from the Belmont Historical Society or Amazon.com. This overview is from Belmont (Then & Now), © Belmont Historical Society, published by Arcadia Publishing in 2004. Copies are available from the Belmont Historical Society or Amazon.com. In 1982 the Belmont Historic District Commission contracted with the Boston University Preservation Studies Program to prepare a comprehensive architectural and historic survey of the town of Belmont. The Massachusetts Historical Commission needed such a survey in order to submit a Multiple Resource Nomination to the National Register of Historic Places. The Belmont Historical Society provided major support to this effort with historic photographs and other documents from its extensive collections. The result of this work was the publication of Belmont, Massachusetts: The Architecture and Development of The Town of Homes in 1984. Although this document is out of print, copies are available for review and research in the Claflin Room. © 2019 Belmont Historical Society. All Rights Reserved.